You’ll never guess how much food is wasted in UK households on average. Brace yourselves… a whopping £470 a year! Not only is that a lot of money, it’s a lot of food too, 700 tonnes of food and drink to be precise. With that in mind, we’ve challenged our mummy blogger Anneliese to feed her family with no food waste for one month. She has to use up every inch of leftovers, from potato peel to the last few dregs of milk in the carton. 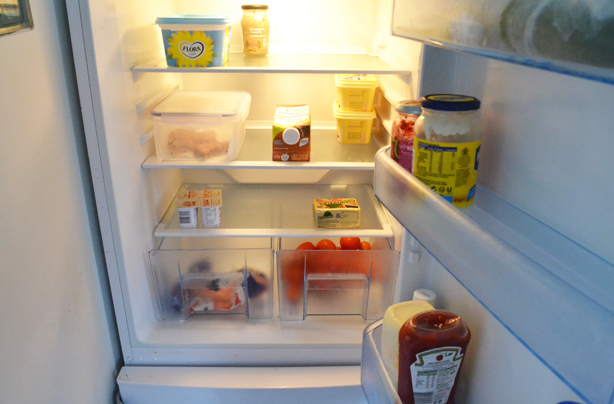 Most of us are lucky enough to own a well-stocked fridge and freezer. When I open the door of my own fridge, I’m greeted by all manner of fruit, vegetables, sandwich fillers and the components for several hearty family meals. However, how much is past its sell by date and how many rogue veggies are festering at the back? I dread to think! 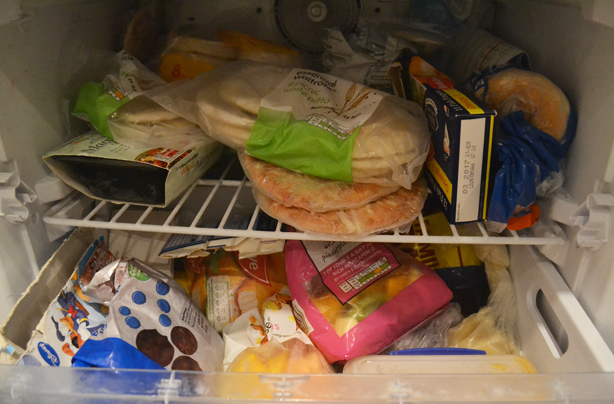 The freezer is packed full of food but I’m sure some of it has been hiding in there for over a year. I hang my head in shame! The sad fact is that, as a nation, we may as well be throwing our money straight into our compost bins – quite literally! According to the Love Food Hate Waste campaign, the average UK household throws away £470 each year, which rises to £700 for those of us with children. This works out to around £60 a month. What?! That £60 could pay for my children’s new winter coats or be saved up for a new TV, the list is endless! If that wasn’t bad enough, here’s another sobering statistic. Out of the 700 tonnes of food and drink that we throw out from our homes each year, almost half of it was perfectly fine. These statistics were a big shock to me. I know that I am guilty of food waste but I didn’t realise that it was having such a big impact on our finances. Although I write a meal plan every two weeks and feel that my family eats a good and varied diet, I rarely make allowances for any leftovers. If we do have a lot of food left over, I honestly have good intentions to save it for another day. I will go as far as putting it in the fridge or freezer. However, I shall then most likely forget all about it and it will end up in the compost bin anyway. Not really a good idea!! I must admit that I often throw away such things as half eaten pots of yogurt or cream which have been left open too long. I also recently discovered a whole bunch of spring onions, hidden under a wilted iceberg lettuce. Let’s just say that I shuddered with revulsion as I threw the whole lot away! I always feel a pang of guilt when I find an item of food which has gone past its best. The trouble is that I am a repeat offender. I know that this is a good opportunity for me to make a very important change. It’s time to stop wasting food and save some money at the same time; sounds like a good deal to me! For the next four weeks, my family of four will be eating every last bite and making sure that no leftover food is casually thrown away. Over the course of four weeks I hope to learn new ways to use our leftovers, how to batch cook and to make the most of what we have. I will carry on with a meal plan but I will have to think more carefully about how I can link meals together. For example, if I have a recipe that calls for half a cauliflower, I need to be thinking about how I can use the rest up later in the week. My biggest problem is that I cook too much food. My poor husband and two young boys often look terrified as I approach them with massive mountains of mashed potato or pasta. Instead of chucking the inevitable leftovers out onto the compost, I shall use them up in other meals and also get into the habit of following recipes and actually weighing the ingredients! This first week will be about setting the foundations for a no food waste household. I hope to discover creative ways to use up leftovers and put my fridge and freezer to good use. Do I have to throw all the fruit and veggie peelings away? I’m keen to look for alternatives! I’ll also be trying out some of the ideas suggested here by Love Food Hate Waste and hopefully start to see our food waste get smaller and smaller – and my purse get fuller and fuller, each and every day. For the past seven days, my family and I have been trying to eat every last bite of food. When my children push their dinner plates away, I’m there, ready to gather up any viable leftovers… It certainly makes dinner time more interesting! As I store up leftovers, my mind is ticking, thinking of when and how I can use them. When none of us could manage all of my Bolognese, I gathered up the leftovers and transformed it into a spicy chilli later in the week. 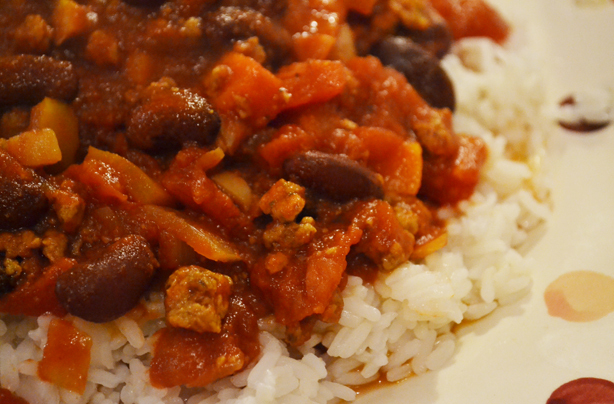 An extra tin of chopped tomatoes and some red kidney beans were all that were needed to bulk it out and it provided us with another hearty meal. Almost two meals for the price of one! This past week has certainly proved that I do not have a clue about portion control. I have a strong greedy streak and assume that everyone else is the same. I pile our plates sky high with food and feel confused when my husband and children announce that they are stuffed, just halfway through the meal. I usually leave my own plate clean! This week, I cooked far too much pasta and mashed potato. It’s so easy to fall into old habits! However, despite my errors of judgement, I resisted the urge to pile up our plates and recycled the extra food into other meals instead. The extra pasta was made into a very tasty pasta salad, which we enjoyed for lunch the following day. I simply added some cucumber, celery, sweetcorn, grated carrot and salad cream. We eat a lot of sandwiches so it made a nice change. The mashed potato is currently stored away in our freezer, waiting to be made into fish cakes. So often we only need a small quantity of an ingredient for a meal and I found this when I made my macaroni cheese with butternut squash. I only required half the squash. Instead of leaving the remainder to go bad in the fridge, I incorporated this into my meal plan and used the leftover butternut squash in a yummy soup. The boys loved the soup and are already requesting another batch. This is almost a shame as it took me about half hour to slice through the butternut squash; we had quite a wrestling match! Maybe it is easier to buy it already sliced and frozen. There would surely be less waste that way as you can use exactly how much you need. With this in mind, I have frozen the chopped onion I had going spare after making pizzas. This will save me slicing (and crying) the next time I need onion in a recipe! I’ve also learnt this week that grapes can be frozen successfully. We weren’t eating our fresh grapes fast enough and one or two were starting to go mouldy, so I put the remainder in the freezer and hoped for the best. They turned out to be delicious and they reminded me of boiled sweets. I’m thinking that frozen grapes would also make a nice alternative to ice cubes in drinks. I’ll have to test that theory! Although personally, my main concern is throwing out food that has been left in the fridge too long or the forgotten fruit left to wither in the fruit bowl, I’m also interested to find out if there are any ways to make use of our fruit and vegetable peelings. It’s a natural reflex to throw our peelings into the compost bin but it’s fun to think of ways to use them instead. This week, I enjoyed making potato and carrot peel crisps. We eat our way through a lot of potatoes and carrots and the peel quickly fills up our little compost bin, so this seemed like a good place to start. 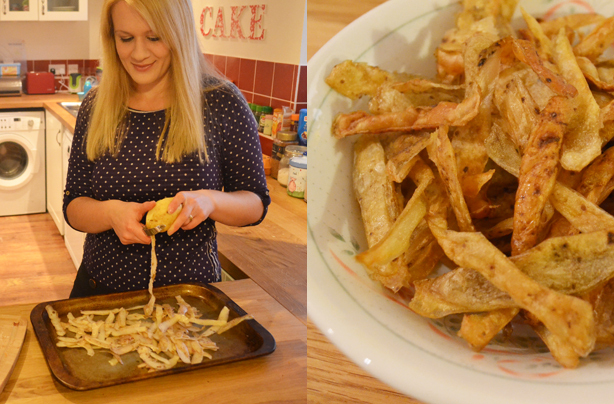 It did feel a little odd to use my vegetable peelings to make crisps, but they were so simple to make – I only added a drop of oil and put them in a hot oven. The finished crisps were suitably crunchy and they tasted good. I sprinkled over a little salt but you could season them however you fancy. Another way to use up veggie peelings is to turn them into stock. Find a lot more ideas here too. It is horrifying to hear from Love Food Hate Waste that we throw away SEVEN TONNES of food and drink from our homes every year in the UK, and more than half of this (4.2 tonnes) would have been perfectly fine to eat or drink. My family is guilty of playing our part in this food waste but there is one food that we throw away more than most – bread. It appears that we are not the only ones. A shocking 24 million slices of bread are thrown from our homes every DAY! I love bread and could happily eat it all day long, but there are always a few slices of stale bread left over. I wish I remembered to turn them into breadcrumbs; it does seem like the obvious solution! However, in an attempt to redeem myself, I decided to use stale bread in a recipe and made these seriously moreish bread pudding bites. YUM! Not only was it fun to make with my little boy but it also felt good to make use of perfectly decent bread. I’m now thinking of turning future leftover bread into homemade stuffing (and also try to remember to make those breadcrumbs!). When I planned for this week of meals, I was careful to link our meals together, but I also took advice from Love Food Hate Waste and made sure I left one day free, to allow for a leftover meal. This can be something stored in the freezer or fridge. I used my ‘free’ day to make the chilli and rice. There was no peeling or slicing and no strenuous cooking involved. This is great after a busy day when you really don’t feel like getting stuck in the kitchen. Making use of leftovers not only saves time in the kitchen but is also is less damaging to our bank accounts! I only needed to pop to our local shop to pick up milk, bread and a few extra vegetables during the week. Not many additions were needed. This was due to planning our meals but also because I was more careful with leftovers and making the food stretch further. The contents of our compost bin have been reduced by almost half and I have saved almost £10 this week. I feel certain that the food I have stored in the freezer will have a knock on effect on the weeks to follow; so hoping for even more savings! Dinner time can be a stressful experience in my house. In between cooking our evening meals, I’m also playing referee to my boys. A cheap plastic toy will suddenly become irresistible to both children when my back is turned! Cooking used to be a leisurely, relaxing experience but those moments are now few and far between. Now my main aim is to prepare a healthy meal and get it on the table as quickly as possible. New recipes are rarely tried in this house, which is a shame, but I keep to meals that I know my children will eat. Spinach pasta bake, tomato risotto and roast dinners are particular favourites and we have yet to tire of them! My boys are only 5 and 3, and not particularly fussy. However, they are highly suspicious of new ingredients, so I do tend to play it safe. Life is so busy nowadays and cooking can sometimes feel like a bit of a chore. Recipe box scheme HelloFresh may have the answer and it’s on a mission to help reclaim our dinner time. The team is passionate about food and aim to encourage us to cook with fresh ingredients and try exciting new recipes. Another top priority is to reduce our food waste. This all seems like a big undertaking, so I wanted to find out if it was really possible.  Could they help me to rediscover my love of cooking healthy, fresh family meals? Could they put a stop to unnecessary food waste? There was only one way to find out. The first step was to pay a visit to the HelloFresh website. The site was easy to navigate and the philosophy and ordering process was easy to grasp. Apparently, I would be sent a box of fresh, local produce, which would enable me to cook the recipes enclosed in the box. The only ingredients not included are butter, oil, salt and pepper. I usually write my own weekly meal plan. However, HelloFresh has put an end to that. At first, I felt excited about the prospect of scrapping my meal planner but this was swiftly followed by fear. I rely on my planner and I doubted that the boys would appreciate the change and spontaneity! This led me to delve further into my box options. I could choose between a Classic, a Vegetarian or a Family box. The classic box does have the option to choose a few of the recipes but it was also the most expensive, so I decided to go for the family box. I assumed that this would be the most suitable. The family box cost £64 and would provide us with 4 meals; I admit that the price did make me wince. It works out at £4 per person, per meal. I usually try to stretch £4 for an entire meal! However, the website does provide a good breakdown of the costs and a price comparison with several supermarkets. HelloFresh claims that its boxes work out cheaper as you are unable to impulse buy and there is no need to purchase an ingredient that you will only need for one recipe. HelloFresh sources all produce from independent suppliers and you are given exactly what you need; no more, no less. Instead of visiting a supermarket that is full of tempting special offers, you are able just to pop to your local corner shop to purchase bread, milk and other day-to-day necessities. This sounds great in theory, but surely sometimes it’s easier to visit the supermarket when you have to buy breakfast cereal, lunch box fillers and of course, bulky toilet roll and cleaning products. I loved the idea of HelloFresh; I just wasn’t sure how it could fit in with everyday living. One big positive is that there is no delivery charge and you can choose days for delivery. However, you could end up waiting in all day for your box. Unfortunately, there are no time slots available for your delivery. This could cause problems if you work every day. There is, though, the option to leave it in a safe place or with a neighbour, so there are ways around this. What’s in the HelloFresh Family box? When my box was delivered, I have to admit that it felt like Christmas! The box was big and weighed a tonne; it was quite an effort to drag it into the kitchen! The contents were very well packed and the plentiful vegetables looked extremely fresh. The cheese and meat were tucked inside a thick layer of wool wadding and ice packs kept everything chilled. There was quite a bit of packaging, especially when you see the tiny plastic pots of flour and seasoning, but everything is recyclable. Every tiny detail of the meal had been considered and catered for. I had pre-measured sachets of peanut butter and mustard, the cleanest potatoes I’ve ever seen, a huge quantity of cherry tomatoes, masses of lettuce, fresh pizza dough, mozzarella cheese and pork belly; the list is almost endless! I didn’t have to think of anything, which felt a bit odd. The colour printed recipe cards made the meals look very tempting and were helpful. Step-by-step photo guides were also included. Surely I couldn’t go wrong?! The chicken Fajitas were the first meal I put to the test. The recipe card states that this should take 45 minutes to prepare. As this was a completely new recipe, I waited until my husband was home from work so he could watch the boys while I got on with it. I chopped my way through lots of tomatoes and red peppers, sliced a never-ending supply of gem lettuce and even mashed an avocado for homemade guacamole. I was also frying chicken and warming the tortilla wraps; I had quite a lot of things on the go, all at once. I started to feel a little stressed, especially when I looked at the clock. The meal actually took me an hour and a half to complete and that was with the boys in the living room with Daddy! Neil, my husband, loved the wraps, declaring them to be delicious. However, he wasn’t sure if he’d class wraps as an evening meal. My 5-year-old did eat some of his chicken and wrap, after de-constructing it! My younger boy really struggled with this meal as he was unable to eat his wrap like Mummy and Daddy, and all the filling fell out. It ended in tears and he barely touched it. This meant I had to make him something else, which isn’t really the idea! The following day we looked forward to a vegetable-packed calzone, which was a more child-friendly recipe. Again, this took me almost double the suggested time, despite using the readymade pizza dough. Maybe I’m just a very slow cook?! I had lots of bowls and frying pans on the go and yet again, I was left feeling frazzled and yearning for my own simple recipes. Thankfully, the boys did enjoy their calzone but they barely managed half. The portion sizes were far too big. The family boxes seem to cater for families with older children. We were left with a lot of leftovers, but Neil enjoyed them for lunch the next day! The third meal, the Thai massaman rice with chicken and chestnut mushrooms looked delicious and we had high hopes for it. I didn’t add all of the spicy sauce but the meal still tasted good and had a subtle kick to it. At first, the boys were deeply troubled by the mushrooms; my younger son sat shaking his head for some time! Thankfully, after some persuasion, the boys did give it a try and ended up tucking in happily. Again, they couldn’t manage all of it but at least they had eaten well. The final meal of roasted pork belly with honey mustard glaze, mash and green beans had mixed reactions. The boys seemed to enjoy this, perhaps because they are used to this kind of meal. However, Neil wasn’t convinced by the pork belly; he thought it was very fatty. I was just happy to have made a fairly straightforward and familiar meal! I thought all the meals were tasty in their own right. They looked almost as good as the photos on the recipe cards and I felt as though I had produced restaurant-quality food. However, as a mum with two young children, I don’t have any urge or requirement to cook restaurant food. It’s nice, every now and again, but I want the food to be easy for my children to handle and eat. It’s also no fun when you are chopping vegetables for nearly an hour, with 3 or 4 things on the go at once. However, it was fantastic to mix up our usual samey meals and made me attempt new recipes. It was also great for the boys to try new flavours and to decide that mushrooms are actually quite tasty! I’m lucky that my boys are pretty good eaters but not all children will eat green beans, thick slices of leek or spicy food etc. The meals need to be attractive to children, but the recipes also need to be creative when it comes to sneaking in the veggies, which is sometimes necessary with young children! No food waste – at all! The best part about the HelloFresh boxes is the reduction in waste. Our compost bin remained almost empty over the 4 days I used their recipes. Yes, we did have the boys’ leftovers to contend with but Neil happily ate them for his lunches! After using Hello Fresh, I have realised just how much I waste ingredients. I often buy more veggies and fruit than I actually need and then it’s a race against time to eat them before they go bad. I don’t always win the race! HelloFresh boxes are absolutely perfect for professionals who love to cook but have limited time to plan meals or shop for ingredients. Busy families with older children would probably enjoy these boxes too. I think HelloFresh is on to a winner but I don’t believe it is aimed at those of us with pre-school age or very young children. I would certainly consider using HelloFresh again; I do like the overall concept. It’s a great way to keep waste to a minimum, eat healthy, good quality meals and try new recipes. However, all of this does come at a price, so I couldn’t afford to do it on a regular basis – but perhaps every once in a while when I want to liven up our meals! Interested in trying out HelloFresh? We’ve partnered with the recipe box scheme to get you 50% off your first box. It’s all about batch cooking this week! 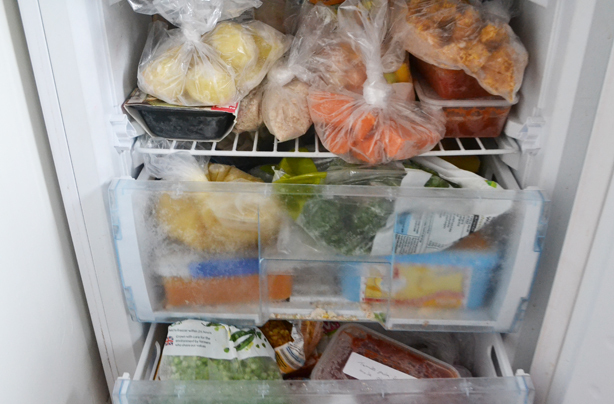 I have found that there is great satisfaction to be had in storing homemade meals in the freezer. I’m a woman obsessed; quite literally! Three weeks into this challenge and it already feels like a new way of life. It’s now second nature to pre-cook tired old potatoes in one big saucepan, then to pop them into the freezer. The next time I come to make a roast dinner, I can simply cook the potatoes straight from frozen and save myself time in the kitchen. Result! I seriously can’t believe that I’d never tried doing this before. It’s so simple and seems so obvious; now I know how! At the beginning of the week, we enjoyed a hearty sausage hotpot. 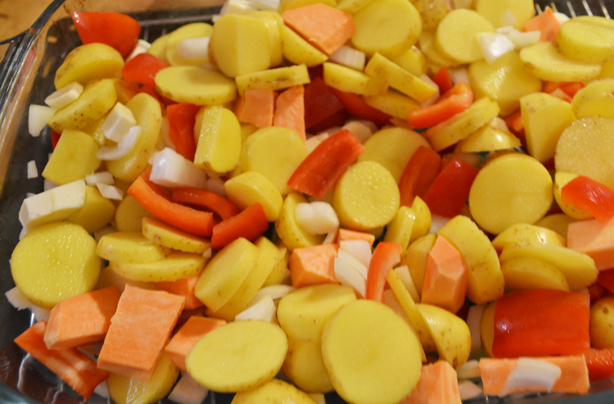 I added whatever vegetables were going spare, such as a few limp parsnips, half a sweet potato, new potatoes, red peppers and onions. The new potatoes had been lurking in our fridge for weeks and weeks. I gingerly plucked the potatoes from the fridge, fully expecting them to be rotten. However, I was relieved to find that they were still in perfect condition! It felt good to make use of them at last. To the vegetables I added chopped tomatoes and a tin of baked beans, along with the sausages. I dished up half the meal and kept half back to put in the freezer. I expected the boys to be suspicious of the vegetable medley but they ended up asking for more. Normally, I would have been delighted to hear my children ask for seconds but I admit that I reluctantly added more to their plates; I think this shows just how obsessed I’ve become with batch cooking! I’m now left with just under half of the sausage hotpot for the freezer. I will have to remember to serve it with some crusty bread to bulk it out a bit more! This week, we have also eaten our way through a lot of pumpkin. When it comes to Halloween, we always carve a pumpkin; it’s tradition. In the past, I usually go on to make a pumpkin soup. However, we often only use half and throw the rest on the compost without a second thought! Things are different this year and to make things even harder, my husband went and bought TWO pumpkins, one each for the boys! I made a massive batch of soup. We had enough to eat on the day and two bags of soup for the freezer. To my frustration, we were still left with just over half a pumpkin. I decided to make a pumpkin cake. I had never made one before but it turned out to be absolutely delicious. It was very similar to carrot cake and in my book, that’s no bad thing! I could have easily gobbled the lot but I was good and put half the cake into the freezer. I felt very virtuous to have used both pumpkins to make yummy things; in fact, I even went as far as roasting the seeds. I can’t say I will have the urge to do this again though. They did not taste good. 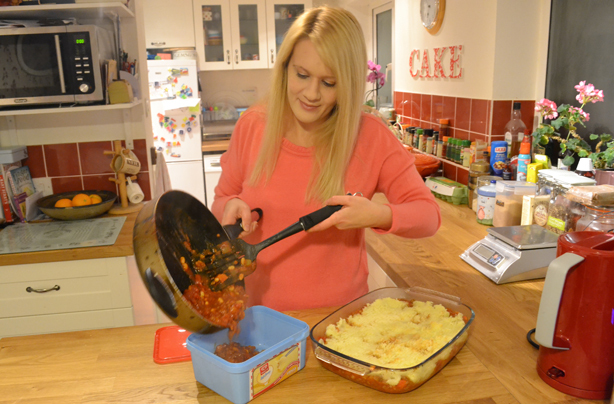 When making my kids’ favourite spinach pasta bake this week, I made my own tomato sauce. At first I was going to make a double batch, one to go in the pasta bake and the other portion for the freezer. However, I ended up adding more and more onions and as many tins of chopped tomatoes as I could find. I only allowed myself to stop once my saucepan was in danger of overfilling! I gleefully filled 4 containers with sauce for the freezer and felt an overwhelming sense of contentment. My absolute favourite meal this week was homemade veggie burgers. For these, I grated up some tired vegetables and simply added oats and lentils. They were a great way of using up leftover vegetables and were yummy. Of course, I made double so that I could freeze half! 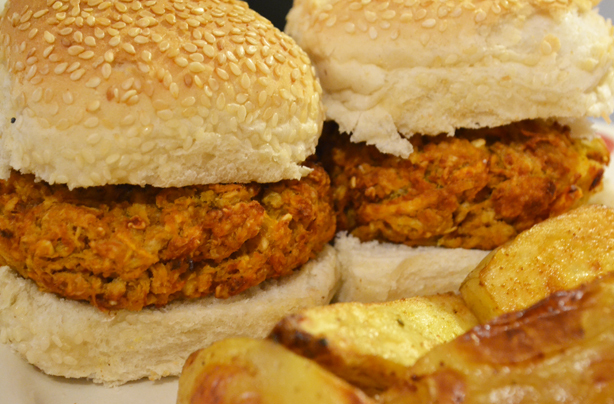 I served the veggie burgers in some bread rolls that had been found at the back of the freezer and some homemade potato wedges. The boys loved this meal and had no idea that they were eating 4 different vegetables. Winner! My husband loves shepherd’s pie so this was another great excuse to make a big batch. Sadly, as I’d been so careful to use up the potatoes, I only had enough for the one meal so I just had the meaty sauce to freeze. Oh well, it will still make an easier meal for next time as I shall only have the potatoes to contend with. Apart from all this batch cooking, I did calm down long enough to think of a way to cut back on all the peelings that end up in the compost bin. A lot of orange peel goes to waste in our house so I thought I’d try my hand at making some candied peel. Oh my, it’s addictive! Candied peel makes a lovely gift as it looks pretty and is even more special when dipped in dark chocolate, mmm! Honestly, they are impossible to resist and well worth giving a go. You could try it with lemon or lime peel too! Cooking at the end of a long day is the last thing you want to do and last week was no exception. After a hectic few days with my children, I was lacking the time and energy to cook. I felt very grateful to be able to pluck a homemade meal from the freezer. I was able to reap the benefits of the batch cooking I’d done the previous week and it felt great! Despite enjoying a few days off from the kitchen, it was impossible to avoid it for an entire week and I was also keen to keep our freezer stocked up! Batch cooking is my new obsession and I recognised a great opportunity when I decided to make chicken nuggets this week. My boys love chicken nuggets, but I worry about the quality we buy. It’s a bit messy to make your own but it’s worth it when you can freeze half, so I bought enough chicken for a double batch, rolled up my sleeves and set to work. 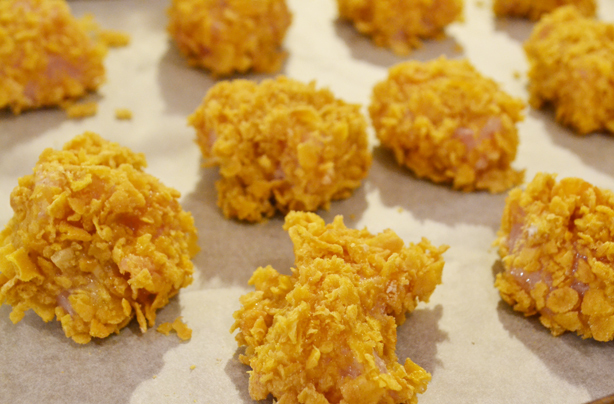 I had some stale cornflakes going to waste, so I used them to coat the pieces of chicken in the hope that the nuggets would end up nice and crunchy. The boys were most impressed with the cornflake chicken nuggets so it’s a good job I have more in the freezer! Of course, I’m still busy using up our leftovers but we now have far less to contend with. Over the past few weeks I have been careful to weigh the correct amount of pasta, rice and potatoes instead of just making wild guesses! I still managed to make too much porridge at the weekend but as it turned out, this was no bad thing. I stirred natural yogurt and frozen fruit into the leftover porridge and my elder son happily took it to school in his lunchbox. The frozen fruit defrosted throughout the morning and kept his little pudding nice and cool. He adored it and insists that I make too much porridge next time! This week, I also ended up making smoothies for myself and my 3-year-old. When checking the contents of our fridge, I’d discovered that some of the kids’ yogurts were 2 days past their sell by date. Whoops! Normally, I would have thrown them away but on this occasion, I decided to perform the ‘sniff test’. After acknowledging that the yogurts smelt fine, I added them to some frozen fruit and made smoothies. Although my son and I both shivered while we drank the ice cold smoothies, we both lived to tell the tale, despite the out of date yogurts! This challenge has also drawn my attention to the food that’s been stored in our freezer for way too long. This week I pulled some long forgotten tortilla wraps out from under a bag of frozen peas, which must have been in there for over a year! The wraps were so brittle that they broke into multiple pieces. I also discovered another packet of tortilla wraps, which were still edible (yes, I had two packets!) so I made them into pizzas with my younger boy. I had some leftover passata in the freezer which I used to make a great tomato sauce. We then sprinkled over some onion, sweetcorn and cheese. They were so quick to make and we all loved them. In an effort to use up all the abandoned food in our freezer, I also turned a packet of puff pastry into cheese and pickle pinwheels for lunch. They were demolished in less than 5 minutes! Why hadn’t I thought to do this sooner?! This challenge has been such a learning curve. I had thought my family might struggle to eat every bite, but it is actually fairly easy to achieve. Once I was aware that food waste costs the average household in the UK £470 a year, I knew I had to take action. Realising that I could save at least £10 each week was a big incentive to make a change. We have cut down our food waste to the minimum and our compost bin is no longer overflowing! Over the past 4 weeks, stale bread has been made into bread pudding and breadcrumbs, potato and carrot peel have been transformed into delicious crisps, tired vegetables have gone into homemade burgers, leftover Bolognese turned into a warming chilli, orange peel into addictive candied peel and SO much more. There is such a sense of satisfaction when every last scrap of food is eaten. It’s also a great feeling to have saved almost £50 from making such simple and easy changes. I used to be guilty of throwing fruit and vegetables away when they looked a bit sad or for forgetting to use up the yogurt or cream that had been pushed to the back of the fridge. Now I know that, with just a little bit of planning and thought, there is no reason for throwing away perfectly edible food. With just a little bit of thinking power, we can make a change. Freeze leftover mashed potato, then make fish cakes or bubble and squeak! Don’t throw away stale bread. Make it into breadcrumbs, bread pudding or make your own stuffing. Vegetable and fruit peelings don’t have to end up in the compost bin. Turn potato, carrot or parsnip peelings into oven baked crisps or use them to make your own stock. Orange, lemon and lime peel can be made into candied peel. Dip them in dark chocolate for a luxurious treat! When you cook a meal, make double and freeze half. It’s so handy to have a homemade meal in the freezer for those busy days! If you find some tired-looking potatoes, don’t throw them away. Pre-cook them for 5-10 mins in boiling water, then freeze them. You will have almost instant roast potatoes for your next Sunday lunch! Leftover vegetables can be made into a delicious and healthy soup. If you have something in your fridge that is a day or two over its best before date, use your nose. If it smells OK, then it’s generally still fine to eat! Likewise, if you have eggs that are past their best before date, check for freshness before throwing away. Simply place them in jug of water. If they sink to the bottom of the jug, they are perfectly fine to eat. However, if they float, get rid of them! If you have leftover pasta, make a pasta salad and enjoy it for lunch the next day. 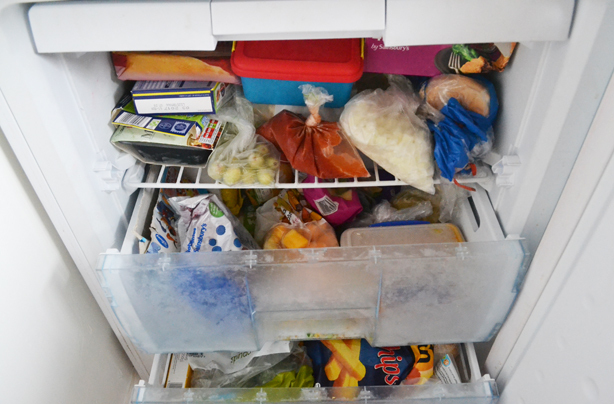 Check your fruit bowl, vegetables, fridge and freezer before shopping. Use up what you already have before you add more!